This Article is speculation. It is not fact. The entire premise of this article is based on second hand information, which I am unable to verify. Pokémon Black and Pokémon White as I write this has just been announce in Japan. The actual reading of the Japanese text is as close as one can get to write the English words Black and White in Japanese. They are the next Pokémon games, the so called 5th Generation, with new Pokémon and a whole new region. Red, Blue and Yellow are considered the First generation, as you can only catch 151 Pokémon, 2nd Generation is Gold Silver and Crystal, with 251 Pokémon. The 5 Pokémon Gameboy Advance games are 3rd Generation, while the 5 DS Games currently out are considered the 4th. Unlike previous games at less than a year before release, there are very few Pokémon known, with less than year to go before the new game. There has not been an appearance of one in the Anime yet, where at least one has been seen beforehand. Gold’s Mascot Ho-Oh was seen at the ending of Episode 1, Keckleon was seen over a year before the Ruby and Sapphire was released. Munchlax was seen in the Destiny Deoxys Film which was just 2 years before Diamond and Pearl. I am using the Japanese Air/Release dates as reference, as almost all Pokémon information is revealed in Japan first. What do we know about these new games? Not that much has been revealed, we have very little information. The only facts we know is that combatable with the first Nintendo DS, apparently due to Japanese law, that game format has to be stated. Also we know that the Diamond and Pearl Series of the Anime will end soon. It is expected to be the week before Black and White is released, and a new Series based on Pokémon Black and White, to air on launch week. This is speculation, but what has been seen so far, the main formula hasn’t changed greatly. Some Pokémon will be missing in one game, and can only be found in another. You play a trainer who wears a hat. (All the playable characters so far wear head gear, excluding Wes, who just has his Sunglasses up.) The Press releases show there are still caves, and town and Pokémon centres. So far there are two known Pokémon known Zorua and Zoroark. All I know about them is that Zorua will evolve in to Zoroark, and it is said that both can make themselves look like other things. In one movie trailer, Zorua has been seen appearing as Celebi, while Zoroark has seen changing between all three of the Legendary Beasts, before turning in to Ash Ketchum, and then jumping over the real Ash. Note that the names of the new Pokémon are transliterated from the Japanese katakana, and names could be changed for the localised versions. (Currently, there are several Languages that the game currently localised in to, in addition to the original Japanese.) For those who don’t know “to transliterate” is to represent letters or words in the characters of another alphabet, script, or in semantic equivalent words of another language. Localisation is to adapt a product for use in a particular country or region, typically by translating text into the language of that country or region and, if necessary, ensuring support of different character sets. In Pokémon Heart Gold and Soul Silver had to go as far as altering the game rooms to not contain slots, keep get the same ratings as older games. According to yaminokame, an English speaking Pokémon fan in Japan, tells us that the three event Pokémon available in Japan for the 5 4th generation Pokémon games will do something in Black and White. It does not state it directly but it suggests you will be able to send Pokémon to the new games. This article will explain how I think how they will do it. The first question is how you get data from one Game card to another. The IR data option in Heart Gold and Soul Silver is not considered as it’s not present in other games. It has been worked out that a Pokémon data size is under 150 bytes, as subsequently the data for one Pokémon is reasonably quick to transfer. To put it in context, the “Favicon” for this site is 9 times bigger, at 1,406 bytes. The recording of the Data is the slowest part of the current games. Slot 2 on the DS is the GBA slot, and the DSi Family does not have one. I don’t think it will be used again, unless the new cart acted as a temporary store. However this would have to been programmed in the DS games already, I doubt it has. However, Black & White may have the “Migrate from GBA Game” option as in the current DS games, and it would work almost exactly the same. Taking the name from the Sonic & Knuckles game setup, the user experience could be the same. The idea of sticking a second cartridge in to another is one of the fastest methods of getting data off the second Cartage. Possibilities could extend to having 5th generation only Pokémon in the 4th Generation games. However, the biggest worry I have is that the cartridge has to be large to prevent accidental damages, and extend outside the DS, due to the size shies away the game being as portable gaming friendly as its predecessors. If the Game was made on one cartridge and a second cartage that has two DS sockets, known as the Mediator. This Mediator Cartage can access all data on two games, this has the advantage of the lock on cartage without the bulk. But I doubt that Nintendo will make a cartage that is only used for a minor function of a few games. The current Pokémon games can allow other games to take control of it, via wireless transmission. Currently, only the following Wii games show this ability Pokémon Battle Revolution, and My Pokémon Ranch. Both games request and then receive all the required data to transfer Pokémon, in a matter of moments. All three Pokémon Ranger games require you use two DS to transfer Event Pokémon. I’m leaning to this being one of the most likely Sole candidate and one possible method if multiple methods are available. The Wii game takes control as some other Wii Pokemon games do, the Wii is simply acting as temporary storage, while a user swaps the DS Cartridges. This is more or less like the WiiWare game My Pokémon Ranch, but with 5th generation abilities. Disk Games may add channel to a Wii, in addition to purchasing the game via the Shop Channel, with ether using Wii Points or a Voucher in the Box (as used for Wii Speak). I don’t see this being the Primary Sole Candidate, but a very possible candidate if others are used. As it can run programs off its internal memory, DSi having internal memory is ideal for keeping small amounts of data stored as you swap DS Cartridges. However this would limit who would be able to transfer Pokémon as this would automatically lock out the original DS, and DSlite owners. Unlike the Wii, the storage program could be on the Black or White Cartridges, and installed in similar method as the Wii Fit and Mario Kart Channel are added to the Wii. Like the using the Wii for Temporary storage, this it does not seem to stand out as the Candidate, but very possible if combined with one of the others. Quite a lot of players trade and battle online, while others still trade and battle locally. Due to the way that all the Pokémon games are made, no new moves can be given to the older game. It is very annoying that a player must organise his or her party, every time the wanted to play cross generations. However, these restrictions have been seen before with the Time Machine in Gold Silver and Crystal. I doubt this will happen at all. Unlike the other Online trading system, where you know who the other person is, while this system makes trades as your DS is off. The basic principle is that you place a Pokémon online, and request a Pokémon in return. Someone searches for a Pokémon, and if they have a Pokémon that you are requesting, they will send the Pokémon, and receive your Pokémon. If you have a Pokémon that has no new moves, you could be able to trade to the 4th generation. The problem is that any new move must be deleted. However, jumping back a generation may not be an option. There are several problems arise when moving between generations. Pro: The old Pokémon find a new home, whist the owner of the new games does not have to prepare an old party to bring back to the old games. The existing rule of HM Moves removal is to prevent gamers getting stuck in a place where they can’t escape. Also only removing from a box means that the current party is untouched, and allows the current party to reach a Pokémon Centre. Since any new data required for the newer games will either be generated when transferring, or during a transferring Mini game. Con: There are limited methods to this in a DS to DS setting. 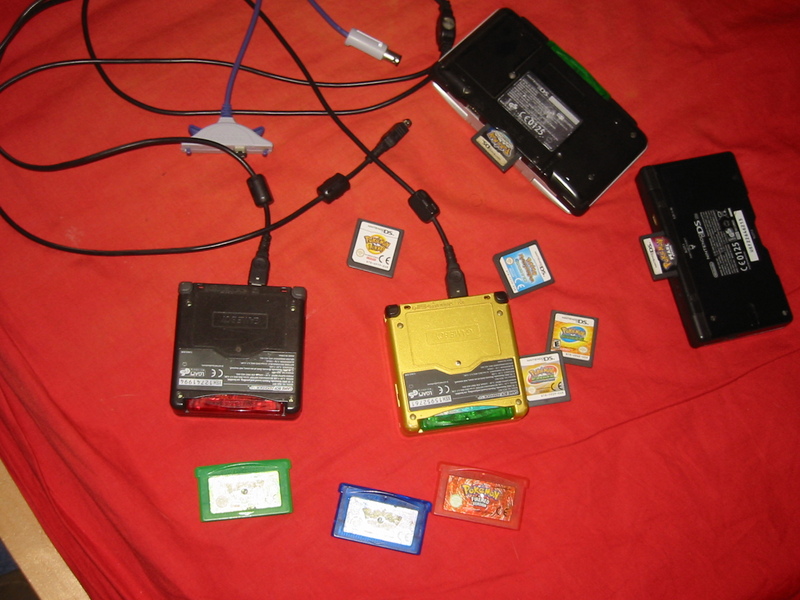 The GBA to DS worked well since you can place both DS and GBA Games in the same system. DS to DS does not make it easy, as there is no hardware with two DS slots available for most customers, yet. This method is not available via Wifi. Also the old game loses Pokémon. Pro: The Older Pokémon can be send back to the old games, and get Move Tutored if the old game doesn’t contain it. The reduction of the old game box does not happen. I expect that they will have a one way system like they have in the current DS games. I see them having using two Local DSes at once, as the Primary and possibly only method, at least around launch. Personally, I believe that the current transfer restrictions for individual Pokémon being added to Black and White should remain in place. Since Red and Green was not intended to have sequels and was not expected to connect to another system, aside from another Red or Green. Since Gold or Silver could not take control of Red or Green, it was forced to act as a 1st Generation game. The Nintendo 64’s Transfer Pak got around this problem by accessed the memory data directly without the need to start the game. However, they coded Ruby and Sapphire games to run code from another system, the only system to this with was the Game Cube. The GBA-Game Cube lead was announced prelaunch; meaning that the hand held games was expected to communicate with the concurrent console games like this. Each Gameboy Advance would display data from the Game Cube game. Examples: an image of a Jirachi in the players’ room for Pokémon Channel (PAL Only), Both Colosseum and XD ran a customised battle menu. Pokémon Box allowed you to move full boxes around. Since the DS games can access the data without starting the game, there was no portable game that would take control of another GBA game. The DS has a similar set up mainly to due to the wireless nature of the consoles; the user has an option to connect to other consoles on the main menu when you start the DS games. As I said at the outset that was speculation. Speculation is educated guess work, based on previous data. This entire article could be proved wrong. I do not work for Nintendo or any company that is involved with creating or promoting Pokémon, so I don’t have any idea what the future will bring in terms of Pokémon. Actually, I don’t have a job. In the first few weeks, over a Million Customers per Versions tells me, whatever Nintendo does, the Pokémon games are not going to be stopped for some time. EDIT: Since the games are now, they made it work differently than I expected. In a Anti Piracy method, one must use the DSs own Game download function, not the built in system, as shown by My Pokémon Ranch and Pokémon Battle Revolution. I don’t know how speculation on a Pokémon that has only just been announced helps for a College work. But what ever helps. You can send the Pokémon on the Game cube to Black and White, indirectly. You’ll need the GBA-GC lead and GBA, with a GBA Pokémon Game, as well as a two DSes. Just a slight update.. Current Info states the 3DS should be able to Play most DS games.